Hashish seized by HMCS Regina in the Indian Ocean. 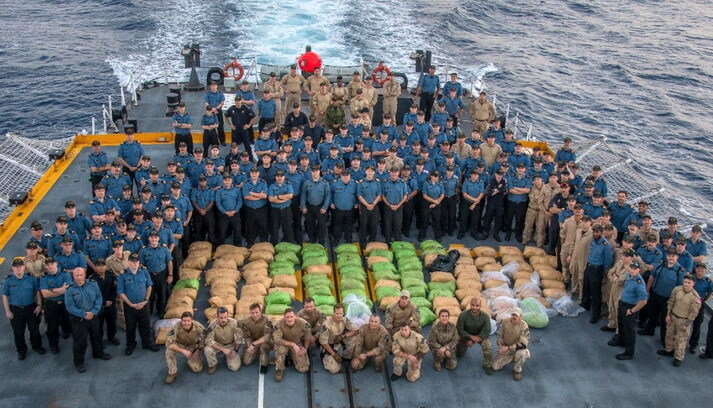 On 6 April, Her Majesty’s Canadian Ship (HMCS) Regina seized 2 569 kilograms of hashish while deployed in the Indian Ocean as part of Operation ARTEMIS, the Canadian Armed Forces ongoing contribution to counter-terrorism and maritime security operations in Middle Eastern and East African waters. The Canadian Armed Forces said that HMCS Regina spotted a suspicious fishing vessel, known as a “dhow”, off the coast of Oman and proceeded to stop the boat to investigate further. The ship deployed its Naval Tactical Operations Group (NTOG) team. The NTOG is a dedicated Royal Canadian Navy unit that specializes in advanced boarding operations at sea. A search of the dhow was conducted, during which 119 bags of hashish were located in the ice hold. The narcotics were transferred to HMCS Regina and subsequently destroyed. “This seizure is a testament to the months of hard work HMCS Regina has conducted in preparation for our operational deployment. I’m very proud of the professionalism of our NTOG team, as well as our entire ship’s company. It was an all-ship effort and we are all proud to contribute to the disruption of the trade of illegal narcotics and in promoting a safer maritime environment in the region,” said Commander Jacob French, Commanding Officer HMCS Regina. “Had CTF 150 not intervened, the hashish would have been sold locally, or in other markets, with the profits benefitting organized crime networks and terrorist organizations. A job well done to HMCS Regina, in their support of CTF 150’s work to promote stability in this part of the world,” said Commodore Darren Garnier, Royal Canadian Navy, Commander CTF 150.